Team-Tetsujin has just recently released two new products, their Lexus IS F SPORT TRD.Version and a new Super RIM Chrome and Black Lycoris rim. Thank you so much fast shipping and good packing. Very good communication and good service. Excellent quality from Team Tetsujin. Thank you Atees! 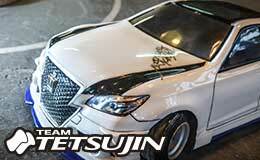 Team-Tetsujin is an up and coming brand that is well-known for their drift rims! With a focus on product planning, development, manufacturing, and selling the best RC products available for drift models, Tetsujin enjoys creating efficient items that are affordable but reliable. If you're looking for amazing drift equipment that wil push your vehicle to the limit, this is what you need.